After writing 34 Maigret novels and all of the 28 Maigret short stories, Simenon embarked on writing Les Mémoires de Maigret (Maigret’s Memoirs). He wrote this work between the 19th and the 26th of September 1950 at Lakeville, Connecticut, having moved there from California during July of the same year. It was on the 21st of June 1950 in Reno, Nevada, that Simenon and his wife Tigy (née Régine Renchon) divorced. The following day the author married Denyse Ouimet. He and his second wife, with their son Jean (John), decided to move to Connecticut where he bought Shadow Rock Farm at Lakeville. By legal agreement, his first wife, Tigy, moved into a house at Salmon Creek only four miles away with her son Marc and Boule. Having carried out some interior restoration of Shadow Rock Farm, Simenon invited his new mother-in-law, Denyse’s mother, to stay for a while. ‘She [Denyse’s mother] was not used to going to bed before one in the morning, whereas I have always been an early retirer. That upset my schedule somewhat, because she did not read, did not like to be left alone, and could talk on for hours about her friends and acquaintances in Montreal and Ottawa. I could not spend my days and long evenings listening to her and politely nodding. Nor could I write a demanding novel, which required a well-observed schedule and strict discipline. I was looking for an easy subject, without dream or mystery, and that was when I got the idea of writing Maigret’s Memoirs. To me, it was something like writing a letter to a friend, and therefore entertaining.’ (Simenon, Intimate Memoirs, Hamish Hamilton, UK 1984; Harcourt Brace Jovanovich, USA 1984, page 321). 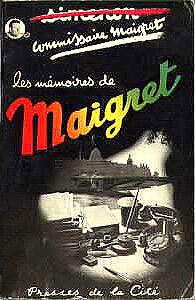 Those who have read the Maigret works prior to these Memoirs, will recognise some of the events that are described, as Simenon has related certain aspects of these in such novels as L’Affaire de Saint-Fiacre (The Saint-Fiacre Affair / Death of a Countess / Maigret Goes Home / Maigret on Home Ground), La Première Enquête de Maigret (Maigret’s First Case), Maigret (Maigret Returns) and the short story L’Amoureux de Madame Maigret (The Stronger Vessel / Madame Maigret’s Admirer). But in the first chapter of the Memoirs there is an intriguing idea of balancing reality and fiction. At the Quai des Orfèvres, Maigret is called to the director’s office where he is presented to a young author by the name of Georges Sim, so that the creation appears to come face to face with the creator at the instigation of Xavier Guichard who for some years was the real life director at police headquarters. But a young Simenon as Georges Sim (his most frequently used pseudonym) annoys Maigret for appearing not to be interested in the functions of the police department, but only in the atmosphere of various corridors, offices and other rooms. One morning, some time later, Maigret finds a cheap looking novel on his desk entitled La Jeune Fille aux perles (The Girl with the Pearl Necklace) written by Georges Sim in which a commissaire named Maigret appears. (This latter novel, probably written in 1929, was published in 1932 by Fayard, but with the title of La Figurante (The Extra) and under the author’s pseudonym of Christian Brulls. La Jeune Fille aux perles was an alternative title, which was restored with the 1991 reprint published by Juilliard). Perhaps Simenon’s memory of the original title and pseudonym was at fault, but whatever the reason, this was the second novel, written under a pseudonym, in which a police detective named Maigret appears. In March 1952, from his home in Connecticut, and accompanied by his second wife Denyse and son John, Simenon made a visit to Europe which lasted just over two months. His trip included personal visits as well as several official functions, one of which occurred in May, in Brussels, where he was elected to the Belgian Royal Academy. But earlier in April, whilst staying in Paris, he was invited to an official reception at 36 du Quai des Orfèvres, where he was shown around Police Headquarters, thus echoing his younger self as described at the beginning of Maigret’s Memoirs written less than two year before. This work is divided up into eight chapters, each one devoted to certain aspects of Maigret’s life, both private and professional, as well as expressing his thoughts on some key issues. Maigret’s Memoirs is easy and entertaining to read, with Simenon convincing the reader that it is really the retired Maigret who is penning his experiences of his career and life as a whole. The English translation is by Jean Stewart who follows the author’s French text closely. 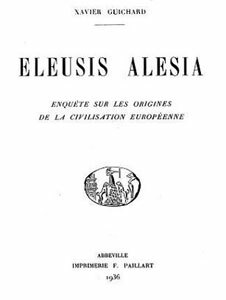 The French edition was published early in 1951, but English only readers had to wait twelve years before the translation was published in the United Kingdom, and even longer for the American edition, which appeared only in 1985. 1929-1972: the two pivotal dates in the Maigret corpus. Let us note the interesting fact that Maigret's Memoirs falls exactly at the middle of the writing period (1950). It's a little as if Simenon, after the first two epochs of the corpus (Fayard and Gallimard), having set his character in his historical reality by relating his beginnings (PRE), made a point of elucidating his hero before launching him into a long series of new investigations. 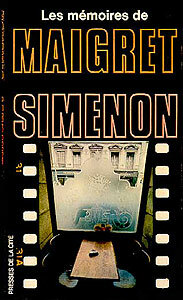 Maigret's Memoirs is an attempt by Simenon to both set the Chief Inspector in a police reality, and at the same time to give him a certain "authenticity", by giving him a past, origins, memories... and also by having him engage in a certain reflection on his métier. The chapter opens with a date, which we can regard as both fictitious  but established according to the chronological reality of the character of Maigret, who presumably writes his memoirs in 1950  and also authentic, on the side of the chronological reality of the author, Simenon. If Simenon wrote his first Maigrets in 1929, it is completely plausible to consider the occurrence of a visit by Simenon to the Quai des Orfèvres in 1927 or 1928  preceding their writing. In 1950, Maigret wrote his Memoirs and told how, one day, in his office at the Quai des Orfèvres, he received a visit from a young Belgian with plenty of pluck, who wrote police novels under the name of Georges Sim. In this volume, Simenon amuses himself by rectifying, through his character, some errors committed on his own part, above all with regard to the earliest investigations. This anecdote  Simenon's visit to the Quai des Orfèvres  is almost true, but takes place after the appearance of the Memoirs. The author, especially in the first Maigrets, hardly cares about an accurate description of the activities of the Police Judiciare, wherein he had never set foot. It was on April 18, 1952 that Simenon was invited to the P.J. by its director, Xavier Guichard (who had investigated the Bonnot gang). And he made the acquaintance of Chief Inspector Guillaume and some of his colleagues, who would subsequently furnish him with more authentic elements for the investigations of the unchangeable Maigret. In this spirit, Xavier Guichard even proposed that Simenon attend the daily meeting  the morning report  which assembled, in his office, the chiefs of the principal brigades looking into the developments of current affairs. And he offered him the opportunity to attend the psychiatric examinations in the special infirmary of the Dépôt. Only a single writer, before Simenon, had received this favor: Paul Bourget. Chief Inspector Guillaume's death touches me personally. It is said that he served as the model for the character of Maigret, and that is partly true. When, after the publication of the first three or four novels of the series, Xavier Guichard, then Director of the Judicial Police, wanted to put me in touch with some flesh-and-blood police officers, and at the same time expose me to the actual operation of the service, it was Chief Inspector Guillaume who was entrusted with the task. 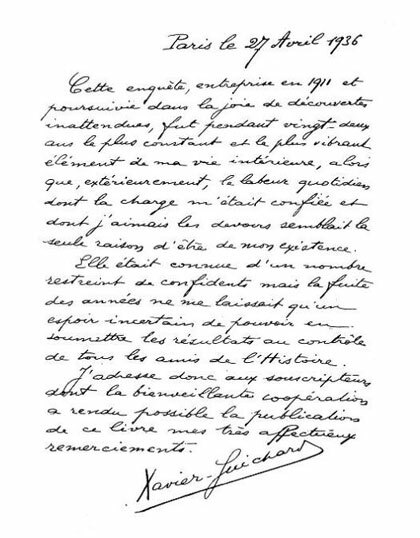 Thus, in 1931, Xavier Guichard, Director of the PJ, famous for his arrest of the anarchist Jules Bonnot in 1912, received the writer to permit him to refine the realism of his writings. "What interests me most is to attend the interrogations, to feel the vibrations", requested the author. He would not be disappointed: on the heels of Chief Inspector Guillaume, head of the Crime Squad, he made the rounds of the services. He attended the morning report and the meeting of the Central Brigade chiefs. Then, did Simenon, or did he not, pay a visit to the Quai des Orfèvres in 1931? The answer, or at least a part of it, can be found in the fact that if Simenon truly had been invited by Xavier Guichard, the 1931 visit is real, because Guichard died in… 1947; and so he couldn't have been the one who welcomed Simenon to the Quai in 1952! And I've tried to tell a police story  a novel, in spite of everything  that could be read out loud before an inspector of the P.J. without him laughing the buttons off his vest." It's without a doubt a unique case in literature, that a hero takes the place of his creator to describe their relationship. That's what makes this novel so original. And not only does the hero talk about himself, to "correct the errors" made by his creator, but the character also gives his vision of his author…. And that provides the occasion for Simenon to do a tasty self-portrait. He describes, with his customary subtle humor, the young man filled with self-confidence who "didn't seem to have doubts about anything  least of all about himself", the writer who tells of himself in the smallest details, "who needed almost 800 pages to recount his youth … and for whom even a neighbor's dog rated no less than half a page", and finally the author who finished by resembling his character, "as if, late in life, he started to take himself for Maigret!" "I must have spoken to him incidentally of a case… concerning a young girl with a pearl necklace. … One morning I found on my desk… a little book with a horribly illustrated cover…. It was called "La jeune fille aux Perles" [The Girl with the Pearl Necklace]." That was, of course, the novel which appeared under the title La figurante [The Extra]. It was as if Simenon had finally come to accept the proto-Maigrets as being in some way a part of the corpus. And it was perhaps easier for him to admit to this "authentication" through the medium of his character! The second chapter of the novel is the opportunity for Simenon to make another kind of clarification: he presents his point of view on "truth in literature". That permits him to both express some of his ideas on his vision of writing, and at the same time, to respond indirectly to critics, regarding the contradictions he had left his character ("I recognize that the books are filled with technical inaccuracies"): "the essential quality of a truth is to be simple. And I have simplified." It is in this chapter that Simenon will set his character in a "biographical reality": developing some elements already evoked in other novels (in particular "L'affaire Saint-Fiacre"). He recounts Maigret's childhood, his social origins, his parents, his studies at Moulins, his ambitions (the famous "mender of destinies"), and finally his meeting with the policeman Jacquemain, who will direct his destiny toward the métier of the police. Still another important aspect in the story of Maigret's life: the place of his wife. Simenon, in whom we recognize a tenderness for this character, dedicates an entire chapter to the meeting between the Chief Inspector and Mme Maigret. This meeting, placed under the sign of petits fours wolfed down by the young and scrawny Maigret, is presented as evidence: Louise, queen of the kitchen and small dishes lovingly prepared, could only fall for a man who appreciated good cooking! These are the two chapters which most strongly moor the character to his police reality. It's as if Simenon is trying to show that Maigret has a life outside of the novels, and as if these were only a small part, more spectacular but exceptional, of the daily life of the Chief Inspector: "The crimes which interest novelists … are so uncommon that they do not comprise a significant part of our activity. … Those are the cases that Simenon has concentrated on, and which, I suppose, he will continue to tell about." Simenon continues to give his character a basically "realistic" framework, in telling of his entry into the Homicide Brigade under the orders of Chief Inspector Guillaume. Guillaume's having actually existed, and Xavier Guichard as well, as a friend of Maigret's father, is a way of giving Maigret an "extra-novelistic" reality. Simenon takes advantage of this also to apply it to the notion of the "métier" of a policeman: "It's about recognition. Knowing the place where a crime has been committed, knowing the kind of life, the habits, the customs, the reactions of the people who are mixed together there, victims, guilty and simple witnesses." Is there a better definition of the manner in which Maigret conducts an investigation, immersing himself into a milieu and putting himself into the place of the people involved? the arrest of the pickpocket, described in PRE and REV. Maigret's beginnings as secretary to the Chief Inspector in the St-Georges district (where he investigates his first case in PRE), also mentioned in JEU and DEF. the different branches where Maigret served his apprenticeship in the police, described also in particular in DEF: public roads, department stores, vice squad (morals), hotels and accommodations, and stations. the cases in those places where "you expect them least", where "there is everywhere a veneer of respectability to crack". Which we can consider the cases of the Gendreau-Balthazars in PRE, the Lachaumes in TEM, the Parendons in HES, the Nauds in CAD, and the Serres in GRA. Mme Maigret's scrapbooks, where she pastes the newspaper articles about her husband: they are mentioned in MME: "So she preserved, in her scrapbooks, the newspaper articles about me and she did it even more scrupulously after a former director of the PJ published his Memoirs. "You might write yours one day, when you're retired and we live in the country," she'd respond when I'd make fun of her hobby." Well, Madame Maigret wasn't wrong! This study, begun in 1911 and pursued with the joy of unexpected discovery, has for 22 years been the most constant and vibrant element of my internal life, whereas externally, the daily work with which I was charged, and whose obligations I loved, seemed my sole reason for being. It was known by a limited number of my confidants, but the flight of the years left me only an uncertain hope of being able to submit my results to the inspection of all the friends of History. I therefore address to subscribers, whose benevolent cooperation has rendered possible the publication of this book, my very affectionate thanks. In Simenon's visit to the Quai des Orfèvres described in Ch. 1, the author takes the occasion to elucidate a little his vision of "semi-literature": "it was less the workings of the police that he wanted to see detailed… than the ambiance in which the operations took place." While in Maigret's investigations there are sometimes described certain forensic techniques (fingerprints, autopsy results, etc. ), and the machinations of the police, it remains the ambiance felt by the Chief Inspector that has much more importance. It is rather by immersing himself in the atmosphere, than in analyzing clues, that Maigret solves his cases. Note on this subject the very interesting study by Els Wouters, from Editions du Céfal : Maigret: "I never deduce", The abductive method of Simenon. Why do you classify on one side the Maigrets and on the other the novels you call your "hard" novels? G.S. The police novel has rules. And these rules are like handrails, like the handrails of a staircase. Which is to say there's a victim, one or more investigators, and a murderer, which make up a puzzle. You have to follow these well-determined rules. If by the second chapter, your reader finds the going a bit slow, he will read to the end anyway, because he wants to know who the killer was. I call this "semi-literature". That's the word which bothered Jacques-Emile Blanche when we met at Nouvelles Littéraires. Because at that time, it was in all the papers. When I spoke of "semi-literature", he asked me what it meant. I responded: a kind of manufacturing. It could be deluxe or 3rd class, as a cabinetmaker can make his furnishings cheap or splendid. But it's still manufacture. With regard to what I call the "hard novels"  and besides it's not me who first used this expression  these are simply novels where there are no handrails. When I felt that I was able to write a novel with no handrails, without established rules, I wrote my "hard novels". By "hard novels" do you mean hard to write? G.S. No, "hard", because I allow myself to tell the truth about my characters. At first, I didn't call them "hard novels", but rather "novel-novels". Which is to say, true novels. Whereas the Maigrets, you type directly on the machine? G.S. Yes, and I wrote them while whistling, or nearly so, because they were that easy. I played. It became more difficult later, because I wound up confusing the Maigrets with the others. I made the characters more complex. For the first 30, they were an amusement. Later, I only wrote a Maigret when I was tired, when I needed to write, but didn't have the physical force to do a novel. To write a 20-page chapter on a typewriter in two and a half hours is tiring. Simenon is probably one of the first authors to set on stage a French hero who was both a "solver" of the enigma and a policeman. If, by the 1920s, "cerebral detectives" (like Sherlock Holmes or Hercule Poirot) were already known, they were generally the issue of Anglo-Saxon literature. The "police" literature of the time sometimes featured detectives, but they were not policemen in the civil service sense of the term; they were journalists (Rouletabille), or even "gentlemen burglars" (Arsène Lupin), and often in these novels the police were ridiculed by the detective hero (like Chief Inspector Ganimard in Arsène Lupin). Simenon himself had started with "detective-adventurers", such as Jarry, or Sancette, who, it is true, is a police inspector, but whose charms are more those of a journalist-adventurer like Rouletabille than a civil servant. Which shows that to introduce a hero who was a simple police functionary in his 50s, living in a bourgeois setting with a homemaker wife with simple tastes, was a risky bet. A risky bet, but a successful one, since "It will therefore be the public who  between the red-headed investigator, version neo-Rouletabille, and the hard-working civil servant, massive, pensive, slow, hardly attractive, even surly  will choose the latter by a landslide" (source: nocesdencre.ch ). And Maigret will inaugurate a long series of Chief Inspectors of Police, who will have fine roles: consider, for example, Chief Inspector Montalbano, created by Andrea Camilleri. For more detail on police literature, see the sites here and here. "February 20, 1931, the onlookers of Montparnasse, however much they were used to local eccentricities, were treated to a strange spectacle. A few steps from the Vavin intersection, at the dance hall "La Boule blanche", usually frequented by West Indian lovers of the beguine, gathered this evening a clientele of dazzling bourgeoisies on the arms of pre-war (that of 1914) toughs… or rather young men trying to pass themselves off as such with the great support of scarves, moustaches, sideburns, bowler hats, caps with a roguish tilt. … All this beautiful crowd … waited joyfully to be sent to jail: at least, almost. After having presented a strictly personal invitation, reproducing the anthropometric card of the bandit Jules Bonnot, the invitees had their fingerprints taken. … the operation sometimes complicated by supplementary measures of identification: inspection of undergarments (for the ladies) and the taking of lip prints (for the singer, Damia). While the West Indian band lets loose, events telescope. Three artists dressed as house painters decorate the white walls with silhouettes of toughs and guillotines; guests who don't find enough room to dance take part in a competition of anthropometric heads. Everyone drinks and has a grand time. The party ends very late, or rather very early: at 7:00 a.m. It is replayed in detail at the top of all the gossip columns in all the day's papers, and will be commented on later by all the periodicals of the capital." Simenon mentions in Ch. 2 the Memoirs written by former policemen. Here is some information I've been able to find regarding these. Marie-François Goron: born in Rennes in 1847, died at Sannois in 1933. He entered the police as secretary in 1881, became Chief Inspector of Police in 1885. Head of the Sûreté from 1887 to 1894, he retired in 1895 and founded the first "Private Police" agency, which exists to this day (GORON S.A). He wrote his Memoirs from 1900 to 1912. Eugène-François Vidocq: born July 24, 1775 in Arras, died May 11, 1857 in Paris. Son of a baker, François Vidocq was a petty thief in his youth, and at the age of 16, joined the revolutionary army. He fought at Valmy and Jemappes, then deserted. He was dismissed in 1793, then followed an adventurous life as a thief and swindler between Paris and the north of France. He was sentenced in 1797 to eight years of hard labor for forgery. At Bicêtre, he was put in the chain gang for Brest, a group of convicts destined for the penal colony from this port. The particularly rough voyage lasted 24 days. He attempted many escapes. Arrested again in 1799, he was sent this time to the penal colony at Toulon, from which he escaped once more, in 1800. In this way he acquired among those of his milieu, an unparalleled respect and notoriety. In 1806 he offered his services as an informer to the police of Paris. In 1811 the prefect put him at the head of the Brigade de Sûreté, a police service whose members were ex-convicts and whose role was to infiltrate the milieu. His numerous successes and his unorthodox methods won him as many admirers as detractors. His enemies were numbered both in the underworld and among those in power. In 1827, Vidocq resigned definitively from his functions as Chief of the Sûreté. In 1828 he published his Memoirs which achieved great success, and which formed the inspiration for Honoré de Balzac's character, Vautrin. In 1833 he founded the Bureau of Information for Business, the first private detective agency, which furnished to businessmen, in return for a fee, information services and surveillance. I've also found other policemen who have written their Memoirs: M. Claude, Chief of Police of the Sûreté from 1859 to 1875, M. Canler, former Chief of the service of the Sûreté (1797-1865). And let's not forget the Memoirs of Chief Inspector Guillaume, also described here. The Sarret Affair: On April 10, 1934 in Aix-en-Provence, the last public execution of the city took place. On that day, Georges Sarrejani, called Sarret, was guillotined before the doors of the Aix prison. This barrister-counsel had committed, between 1925 and 1931 numerous particularly sordid murders and swindles, with the complicity of his mistress, Catherine Schmidt, and her sister, Philomène. Sarret sought out weak people, without family or close friends, whose disappearance would pass unnoticed. Thus, in 1925, he killed, in an isolated house of Aix-en-Provence, a couple he had met some time before, M. Chambon and his companion. After disposing of their bodies by placing them in a bathtub filled with sulfuric acid, he had appropriated their money with a false power of attorney. Some years later, in 1931, he poisoned a tubercular young woman without a family, Magali Herbin, then passed off Catherine Schmidt, on whom he had taken out life insurance, as the dead woman. Arrested in 1931, Sarret was condemned to death and the Schmidt sisters received 10-year prison terms. The proceedings consecrated the celebrity of the little Landru from Aix, enough so that the film-maker Francis Girod produced, decades later, a film with Michel Piccoli, Romy Schneider and Andréa Ferréol, Le Trio infernal. See this site. "I've made of you a man of the Quai. I've tried to make you the very embodiment of it." "For me, a man without a past is not exactly a man. Over the course of certain cases, I've come to value more the time with the family and circle of associates of a suspect than that with the suspect himself." "As a choice, however, I'd much rather go tomorrow and retake my position standing guard at the entrance to the quays, than from a more elegant station, embark for some sunny little corner of the Côte d'Azur." "That's why I insist on the word "civil servant" which others find demeaning. … With the same concern for knowing everything about my métier and accomplishing a task conscientiously." "I'm a part [of the milieu] of what's called honest men. But I know the others also, I know them well enough so that a certain contact is established between us. … And all those others that I meet, that I meet everyday in their most secret private lives. … It's a question of seeing them … with a knowing look." 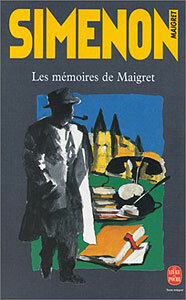 Maigret's Memoirs is not only an original in that it's a character who gives his point of view about his author, but further because the novel evokes a particular link between the author and the character, which is not simply the relationship between a character and his creator, but that of a friendship between them. It's as if Simenon had made of Maigret his double, who both resembles him and is different enough from him to become almost the author's confidant, or at the very least someone whom he can talk with outside of the novel in which he appears. We recall here the famous letter to Maigret from Simenon. In short, Simenon had become "a friend of the family", in particular of Louise, who was "enchanted by the image Simenon had portrayed of her". And this friendship became so deep that it was Simenon himself who came to "seek the approval" of his character, to the extent that, "Little by little, we wound up resembling each other somewhat. I wouldn't be able to say if it was he who had become more like me, or I like him. There's no doubt that I took on some of his quirks and that he took on some of mine. … This is one of the rare, if not the only one of my characters who has features in common with me." (extract from an interview with Francis Lacassin in 1975). Gross, Hans [Sim asks Maigret mid Ch. 1, "Have you read Hans Gross? "]: born in 1847 in Graz, died in 1915 in the same area. Judge in criminal law, then professor at the Universities of Prague and Graz. Founder of the Institute of Crime Detection at the University of Graz and a (criminal museum) in Graz. Author of innovative works on the combat of crime, founder of the "Archives of Criminology". Hob-nailed boots [Ch. 5]: let us note that Boris Vian is the author of a song with this title, the lyrics of which can be found here. February 6, 1934 [mentioned at the top of Ch. 6]: Bloody rioting in Paris as a result of demonstrations by extreme right groups against the government, following the Stavisky affair. In the course of the financial scandal of false cash vouchers from the Crédit Municipal of Bayonne, the crook arrested in 1926 and released on bail in 1928, found on the ground with a revolver beside him on January 8, 1934. Public opinion didn't hold to the theory of suicide but accused the police of having killed him in order to protect high-level persons. The extreme right exploited the affair using its traditional themes: anti-Semitism, xenophobia (Alexandre Stavisky was a naturalized Ukrainian Jew). February 6, 1934, thousands of demonstrators assembled in Paris, converging on the Place de la Concorde, separated from the Chamber of Deputies by the Seine. Policemen and guards were able to defend the Concorde bridge, in spite of the hurling of projectiles of all sorts. Some demonstrators were armed, and the forces of order fired on the crowd. The tally of victims was 16 dead and nearly 2,000 wounded. In the Chamber of Deputies, the right attempted to profit from the rioting to compel the government to resign. But the left formed a bloc behind Daladier. The session was finally closed after an exchange of blows took place in the assembly, between deputies of the right and left. During the night, Daladier took the first measures to obtain the reestablishment of public order. But the next day, his orders were little followed, and it became the first time that a government was forced to resign by pressure from the street. February 7, in the morning, the battle resumed. The clash with the forces of order was short but violent (they lamented three killed, 75 wounded). The crisis was finally resolved with the formation of a new government under the presidency of the former president of the Republic, Gaston Doumergue. Qualified by a government of "national union", he gathered above all the principal figures of the parliamentary right. The left interpreted the events of February 6 as proof of a fascist plot. The Socialists and Communists counter-demonstrated February 9. These incidents opposed by the forces of order took nine victims. On February 12, the CGT (Socialists) and the CGTU (Communists) decided on a day of general strike. That day marked a first rapprochement between Socialists and Communists, and carried the germ of an anti-fascist union between the two parties, which resulted in 1936 in the government of the Popular Front, composed of radicals and Socialists with Communist support. Quai des Orfèvres Prize: a literary prize; see this site. Maigret in the movies: see in particular this site. 1929-1972: les deux dates charnières dans le corpus des Maigret. Notons comme un fait intéressant que Les mémoires de Maigret se situent exactement au milieu de la période d'écriture (1950). C'est un peu comme si Simenon, après les deux premières époques du corpus (Fayard et Gallimard), et après avoir ancré son personnage dans sa réalité historique en racontant ses débuts (PRE), tenait à faire une mise au point sur son héros, avant de le lancer dans une longue série de nouvelles enquêtes. Les mémoires de Maigret, c'est une tentative de Simenon de faire à la fois un ancrage du commissaire dans une réalité policière, et à la fois de donner une certaine "authenticité" à son personnage, en lui donnant un passé, des origines, des souvenirs et aussi en lui faisant mener une certaine réflexion sur son métier. Le chapitre s'ouvre sur une datation, qu'on peut considérer à la fois comme fictive, car établie selon la réalité chronologique du personnage de Maigret, qui est censé écrire ses mémoires en 1950, et à la fois comme authentique, si l'on considère la réalité chronologique de l'auteur Simenon. Si Simenon a écrit les premiers Maigret en 1929, il est tout à fait plausible de considérer comme probable une visite  antérieure à leur rédaction  de Simenon au Quai des Orfèvres en 1928, ou 1927. En 1950, Maigret rédige ses Mémoires et raconte comment, un jour, dans son bureau du quai des Orfèvres, il reçut la visite d'un jeune Belge qui n'avait pas froid aux yeux et qui écrivait des romans policiers sous le nom de Georges Sim. Dans ce volume, Simenon s'amuse à faire rectifier par son personnage les quelques erreurs qu'il a commises sur son compte, surtout lors des premières enquêtes. Cette anecdote  la visite de Simenon au quai des Orfèvres  est presque vraie, mais se situe après la parution des Mémoires. L'auteur, principalement dans les premiers « Maigret », ne se souciait guère de décrire fidèlement les services de la police judiciaire où il n'avait jamais mis les pieds. C'est le 18 avril 1952 que Simenon est invité à la P.J. par son directeur, Xavier Guichard (le policier qui avait enquêté sur la bande à Bonnot). Il fait également la connaissance du commissaire Guillaume et de ses collaborateurs, qui lui fourniront par la suite des éléments plus authentiques pour les enquêtes de l'inaltérable Maigret. Dans cet esprit, Xavier Guichard propose même à Simenon d'assister à la conférence quotidienne  le rapport du matin  qui réunit, dans son bureau, les chefs des principales brigades de police venus l'entretenir du développement des affaires en cours. Il lui offre également d'assister aux examens psychiatriques de l'infirmerie spéciale du dépôt. Un seul écrivain avait, avant Simenon, bénéficié de cette faveur : Paul Bourget. La mort du commissaire Guillaume m'affecte personnellement. On a dit qu'il avait servi de modèle au personnage de Maigret, et c'est vrai en partie. Lorsque, après la publication des trois ou quatre premiers romans de la série, Xavier Guichard, alors directeur de la P.J., m'a prié d'aller le voir pour me montrer des policiers en chair et en os, en même temps que le fonctionnement de ses services, c'est le commissaire Guillaume, chef de la Brigade criminelle, qu'il a chargé de cette initiation. Ainsi, en 1931, Xavier Guichard, directeur de la PJ, célèbre depuis l’arrestation de l’anarchiste Jules Bonnot en 1912, reçoit l’écrivain afin de lui permettre d’affiner la vraisemblance de ses récits. « Ce qui m’intéresse le plus, c’est d’assister à des interrogatoires, sentir la vibration… », requiert l’auteur. Il ne sera pas déçu : emboîtant le pas au commissaire Guillaume, chef de la Brigade Criminelle, il fait le tour des services. Il assistera également au rapport du matin et à la réunion des chefs des Brigades Centrales. Alors, Simenon a-t-il fait, oui ou non, une visite au Quai des Orfèvres en 1931? La réponse, ou une partie de celle-ci, peut être trouvée dans le fait que si Simenon a vraiment été invité par Xavier Guichard, c'est que la visite de 1931 est réelle, car Guichard est mort en …1947; ce n'est donc pas lui qui a pu accueillir Simenon au Quai en 1952! Et j'ai essayé de raconter une histoire policière  un roman, malgré tout!  qu'il soit possible de lire à voix haute devant un inspecteur de la P.J. sans que l'hilarité fasse sauter ses boutons de gilet." C'est sans doute un cas unique dans la littérature, qu'un héros prenne la place de son créateur pour raconter leurs relations. C'est ce qui fait l'originalité de ce roman. Et non seulement, le héros se raconte lui-même, pour "corriger les erreurs" faites sur lui par son créateur, mais encore le personnage raconte sa vision de son auteur…. Et c'est alors l'occasion pour Simenon de faire un savoureux autoportrait. Il décrit, avec l'humour subtil dont il est coutumier, le jeune homme plein d'assurance qui "ne paraissait douter de rien  et certainement pas de lui-même", l'écrivain qui se raconte dans ses moindres détails, " à qui il a fallu près de huit cents pages pour raconter son enfance […] et il n'y pas jusqu'au chien de la voisine qui n'ait droit à une demi-page", et enfin l'auteur qui a fini par ressembler à son personnage, "comme si, sur le tard, il commençait à se prendre pour [Maigret]!" "J'ai dû lui parler incidemment d'une affaire […] dans laquelle il était question d'une jeune fille et d'un collier de perles. […] Un matin, je trouvai sur mon bureau […] un petit livre à couverture horriblement illustrée […]. Cela s'intitulait: La jeune fille aux Perles." Il s'agit ici, bien entendu, du roman qui paraîtra sous le titre de La figurante. C'est comme si Simenon, finalement, acceptait de considérer les proto-Maigret comme faisant quand même partie du corpus. Et c'était peut-être plus facile, pour lui, de l'admettre en faisant passer cette "authentifcation" par le truchement de son personnage! Le deuxième chapitre du roman est l'occasion, pour Simenon, de faire une autre forme de mise au point: il donne son point de vue sur la "vérité en littérature". Cela lui permet, à la fois, d'exprimer quelques idées sur sa vision de l'écriture, et en même temps, de répondre indirectement aux critiques que l'on a faites sur les contradictions que l'auteur a laissées passer à propos de son personnage ("Je n'ignore pas que ces livres sont bourrées d'inexactitudes techniques"): "la qualité essentielle d'une vérité est d'être simple. Et j'ai simplifié." C'est dans ce chapitre que Simenon va ancrer son personnage dans une "réalité biographique": développant quelques éléments déjà évoqués dans d'autres romans (en particulier "L'affaire Saint-Fiacre"), il raconte l'enfance de Maigret, son origine sociale, ses parents, ses études à Moulins, ses ambitions (le fameux "raccommodeur de destinées"), et enfin sa rencontre avec le policier Jacquemain, qui va orienter son destin vers le métier de policier. Encore un aspect important dans l'histoire et la vie de Maigret: la place que prend sa femme. Simenon, dont on connaît la tendresse pour ce personnage, consacre donc un chapitre entier à la rencontre entre le commissaire et Mme Maigret. Cette rencontre, placée sous le signe des petits fours engloutis par le jeune et famélique Maigret, est racontée comme une évidence: Louise, reine du fourneau et des petits plats mijotés, ne pouvait tomber amoureuse que d'un homme qui apprécie la bonne chère! Ce sont ces deux chapitres qui amarrent le plus le personnage à sa réalité policière. C'est comme si Simenon s'attachait à montrer que Maigret connaît une vie en dehors des romans, et comme si ceux-ci n'étaient qu'une part moindre, la partie la plus spectaculaire, mais la plus exceptionnelle, dans la vie quotidienne du commissaire: "[Les crimes] qui intéressent les romanciers […] sont si peu communs qu'ils ne prennent qu'une partie insignifiante de notre activité. […] Ce sont ces affaires-là que Simenon a surtout racontées et que, je suppose, il continuera à raconter." Simenon continue de donner une trame de fond "réaliste" à son personnage, en racontant son entrée à la Brigade des homicides, sous les ordres du commissaire Guillaume. Celui-ci ayant réellement existé, ainsi que Xavier Guichard, ami du père de Maigret, c'est une façon de donner à celui-ci une réalité "extra-romanesque". Simenon en profite aussi pour appuyer sur la notion du "métier" du policier: "Il s'agit de connaître. Connaître le milieu où un crime est commis, connaître le genre de vie, les habitudes, les mœurs, les réactions des gens qui y sont mêlés, victimes, coupables et simples témoins." Y a-t-il plus belle définition de la manière qu'a Maigret de mener une enquête, de s'imprégner d'un milieu et de se mettre à la place des humains qu'il côtoie? l'arrestation du voleur à la tire, évoquée dans PRE et REV. les débuts de Maigret comme secrétaire du commissaire du quartier St-Georges (où il a mené sa première enquête dans PRE), aussi évoqués dans JEU et dans DEF. les différents services où Maigret a fait son apprentissage de policier, évoqués aussi en particulier dans DEF: voie publique, magasins, brigade mondaine (ou police des mœurs), service des Garnis et gares. les enquêtes dans les milieux où "l'on s'y attendrait le moins", où "il y a tout un vernis de respectabilité à faire craquer". Que l'on songe ici aux Gendreau-Balthazar dans PRE, aux Lachaume dans TEM, ou encore aux Parendon dans HES, aux Naud dans CAD, aux Serre dans GRA. les cahiers de Mme Maigret, où elle colle les articles de journaux concernant son mari: ils sont évoqués dans MME: "Elle conserve en effet, dans des cahiers, les articles de journaux où il est question de moi et elle le fait avec plus de soin encore depuis qu'un ancien directeur de la PJ a publié ses Mémoires.  Il est possible que tu écrives les tiens un jour, quand tu seras à la retraite et que nous vivrons à la campagne, répond-elle quand je me moque de sa manie." Eh bien, Madame Maigret ne s'était pas trompée! Dans la visite de Simenon au Quai des Orfèvres évoquée dans le chapitre 1, l'auteur se donne l'occasion d'expliciter quelque peu sa vision de la "semi-littérature": "ce sont moins les rouages de la police qu'il désire se voir détailler […] que l'ambiance dans laquelle les opérations se déroulent." En effet, si dans les enquêtes de Maigret sont parfois décrites les techniques (empreintes, résultats d'autopsie, etc.) et les rouages policiers, c'est beaucoup plus l'ambiance ressentie par le commissaire qui a de l'importance. C'est en s'imprégnant d'une atmosphère, bien plus qu'en analysant des indices, que Maigret résout ses enquêtes. Signalons à ce propos l'étude fort intéressante d'Els Wouters, parue aux Editions du Céfal: Maigret:" je ne déduis jamais", La méthode abductive chez Simenon. Pourquoi classez-vous d'un côté les Maigret et d'un autre les romans que vous qualifiez de « durs »? G.S. Le roman policier a des règles. Et les règles, ce sont des rampes, comme des rampes d'escalier. C'est-à-dire qu'il y a un mort, il y a un enquêteur ou plusieurs et il y a un assassin qui constitue une énigme. Vous devez suivre ces règles bien déterminées. Si au deuxième chapitre, votre lecteur trouve que c'est un peu faiblard, il ira quand même jusqu'au bout parce qu'il veut savoir qui a tué. J'appelle ça de la « semi-littérature ». C'est le mot qui indignait Jacques-Emile Blanche quand on se rencontrait aux Nouvelles littéraires. Car à cette époque, on tenait salon dans tous les journaux. Quand j'ai parlé de « semi-littéraire », il m'a demandé ce que ça signifiait. Je lui ai répondu: une sorte de fabrication. Elle peut être de luxe ou de troisième classe, comme un ébéniste peut faire des meubles bon marché et des meubles admirables. Mais cela reste de la fabrication. Tandis que ce que j'appelle des « romans durs »  ce n'est d'ailleurs pas moi qui ai employé le premier cette expression  ce sont simplement des romans où il n'y a pas de rampe. Quand j'ai senti que j'étais capable d'écrire un roman sans rampe, sans règle établie, j'ai écrit des « romans durs ». Vous voulez dire « durs » à écrire? G.S. Non, « durs », parce que je peux me permettre de dire la vérité sur mes personnages. A l'époque, je ne disais pas « romans durs », mais « romans-romans ». C'est-à-dire les vrais romans. Alors que les Maigret, vous les écriviez directement à la machine? G.S. Oui et je les écrivais en sifflotant, ou presque, parce que c'était facile. Je pianotais. C'est devenu plus difficile ensuite parce que j'ai fini par confondre les Maigret et les autres. Je fouillais davantage mes personnages. Pour les trente premières enquêtes, c'était un amusement. Après, je n'écrivais un Maigret que lorsque j'étais fatigué, quand j'avais besoin d'écrire, mais que je n'avais pas la force physique de me mettre à un roman. Ecrire un chapitre de vingt pages dactylographiées en deux heures et demie, c'est fatigant. Simenon est probablement un des premiers auteurs à mettre en scène un héros qui soit à la fois "résolveur" d'énigme d'origine française et à la fois policier. Si on connaît déjà, dans les années 1920-1930, les "détectives cérébraux" (comme Sherlock Holmes ou Hercule Poirot), ceux-ci sont généralement issus de la littérature anglo-saxonne. La littérature "policière" de l'époque montre parfois des détectives, mais ils ne sont pas des policiers au sens fonctionnaire du terme: on rencontre des journalistes (Rouletabille), voire des "gentlemen cambrioleurs" (Arsène Lupin), et souvent dans ces romans le policier est ridiculisé par le héros détective (voir le commissaire Ganimard dans Arsène Lupin). Simenon lui-même a commencé par mettre en scène des "détectives-aventuriers", tels Jarry, ou Sancette, qui, il est vrai, est un inspecteur de police, mais dont les allures le rapprochent plus du journaliste aventurier à la Rouletabille que du fonctionnaire. C'est dire si mettre en scène un héros qui soit un simple fonctionnaire de police quinquagénaire, vivant dans un intérieur bourgeois auprès d'une épouse ménagère aux goûts simples, était un pari risqué. Pari risqué, mais pari réussi, puisque "Ce sera donc le public qui  entre l'enquêteur rouquin, version néo-Rouletabille et le fonctionnaire besogneux, massif, ruminant, lent, peu séduisant, bourru même  plébiscitera ce dernier " (source: nocesdencre.ch ). Et Maigret inaugurera une longue série de personnages de commissaires de police, où celle-ci aura le beau rôle: qu'on pense par exemple au commissaire Montalbano créé par Andrea Camilleri. Pour plus de détail sur la littérature policière, voyez ce site et cet autre site. "Le 20 février 1931, les badauds de Montparnasse, pourtant habitués aux excentricités locales, se repaissaient d'un étrange spectacle. A deux pas du carrefour Vavin, le dancing "La Boule blanche", habituellement fréquenté par des Antillais amateurs de biguines, attroupait ce soir-là une clientèle de bourgeoises emperlousées au bras d'apaches d'avant-guerre (celle de 1914)…ou plutôt de messieurs essayant de se faire passer pour tels à grand renfort de foulards, moustaches, rouflaquettes, chapeaux melons, casquettes à l'inclinaison coquine. […] Tout ce beau monde […] attendait joyeusement d'être envoyé au dépôt: enfin, presque. Après avoir présenté une invitation strictement personnelle, reproduisant la fiche anthropométrique du bandit Jules Bonnot, les invités se voyaient prendre leurs empreintes digitales. […] l'opération se compliquait parfois de mesures d'identification supplémentaires: inspection des dessous (pour les dames) et prises des empreintes des lèvres (pour la chanteuse Damia). Dans cette cohue joyeuse et pressée de s'encanailler on remarque des écrivains: Francis Carco, Colette, Marcel Achard […] des peintres: Kisling […] des humoristes; des députés; des hommes du monde […]. Tandis que l'orchestre antillais se déchaîne, les événements se télescopent. Trois artistes déguisés en peintres du bâtiment décorent de silhouettes d'apaches et de guillotines les murs blancs; les invités qui ne trouvent pas assez de place pour danser participent à un concours de têtes anthropométriques. Tous boivent et s'amusent. La fête finit fort tard, ou plutôt fort tôt: à sept heures du matin. Elle est retracée en détail en tête des colonnes d'échos de tous les journaux du même jour, et sera commentée plus tard par tous les périodiques de la capitale." Simenon évoque dans le chapitre 2 les Mémoires écrits par d'anciens policiers. Voici les quelques renseignements que j'ai pu trouver à ce propos. Marie-François Goron: né à Rennes en 1847, mort à Sannois en 1933. Il entre dans la police comme secrétaire en 1881. Il devient commissaire de police en 1885. Chef de la Sûreté de 1887 à 1894. Il prend sa retraite en 1895 et fonde alors la première agence de "Police Privée" qui existe encore à ce jour (GORON S.A). Il a écrit ses Mémoires de 1900 à 1912. Eugène-François Vidocq: né le 24 juillet 1775 à Arras et décédé le 11 mai 1857 à Paris. Fils de boulanger, François Vidocq commet divers larcins au cours de son enfance, puis, à l'âge de 16 ans, s'engage dans l'armée révolutionnaire. Il se bat alors à Valmy et à Jemappes puis déserte l'armée. Il en est renvoyé en 1793. Il poursuit alors une vie aventureuse de voleur et d'escroc entre Paris et le nord de la France. Il est condamné en 1797 à huit ans de travaux forcés pour faux en écritures. À Bicêtre, il est incorporé dans la chaîne de Brest, un groupe de forçats destiné au bagne de ce port. Le voyage, particulièrement éprouvant, dure vingt-quatre jours. Il tente plusieurs évasions. De nouveau arrêté en 1799, il est cette fois envoyé au bagne de Toulon, d'où il s'évade encore une fois, en 1800. Il acquiert de cette façon auprès des gens du milieu un respect et une notoriété sans égal. En 1806 il propose ses services d'indicateur à la police de Paris. En 1811 le préfet le place à la tête de la Brigade de Sûreté, un service de police dont les membres sont d'anciens condamnés et dont le rôle est d'infiltrer le milieu. Ses nombreux succès et ses méthodes peu orthodoxes lui amènent autant d'admirateurs que de détracteurs. Ses ennemis se trouvent dans la pègre mais aussi au pouvoir. En 1827, Vidocq démissionne définitivement de ses fonctions de chef de la Sûreté. En 1828 il publie des Mémoires qui connaissent un grand succès, et qui inspirent notamment à Honoré de Balzac son personnage de Vautrin. En 1833 il fonde le Bureau de renseignements pour le commerce, la première agence de détective privée, qui fournit aux commerçants, moyennant finance, des services de renseignement et de surveillance. J'ai trouvé également que d'autres policiers ont écrit des Mémoires: M. Claude, chef de la police de Sûreté de 1859 à 1875, M. Canler, ancien chef de service de Sûreté (1797-1865). Et n'oublions les Mémoires du commissaire Guillaume, évoquées également sur ce site. L'affaire Sarret: Le 10 avril 1934 avait lieu à Aix-en-Provence la dernière exécution publique de la ville. Ce jour-là, en effet, Georges Sarrejani dit Sarret était guillotiné devant la porte de la prison aixoise. Cet avocat-conseil avait commis entre 1925 et 1931 plusieurs crimes et escroqueries particulièrement sordides, avec la complicité de sa maîtresse, Catherine Schmidt, et de la sœur de celle-ci, Philomène. Sarret repérait des personnes fragiles, sans famille ou amis proches, dont la disparition pouvait passer inaperçue. Ainsi, en 1925, a-t-il tué dans une villa isolée d’Aix-en-Provence un couple rencontré quelques temps auparavant, M. Chambon et sa compagne. Après avoir fait disparaître les corps en les plongeant dans une baignoire emplie d’acide sulfurique, il a détourné leur argent grâce à une fausse procuration. Quelques années plus tard, en 1931, il a empoisonné une jeune tuberculeuse sans famille, Magali Herbin, puis fait passer Catherine Schmidt, sur laquelle il avait contracté une assurance-vie, pour la morte. Arrêté en 1931, Sarret a été condamné à mort et les sœurs Schmidt ont écopé de 10 ans de réclusion. Le procès a consacré la célébrité du petit Landru aixois, suffisamment durable pour que le cinéaste Francis Girod en tire, plusieurs décennies plus tard, un film interprété par Michel Piccoli, Romy Schneider et Andréa Ferréol, Le Trio infernal. Voir ce site. "J'ai fait de vous un homme du Quai. J'ai essayé d'en faire l'incarnation." "Pour moi, un homme sans passé n'est pas tout à fait un homme. Au cours de certaines enquêtes, il m'est arrivé de consacrer plus de temps à la famille et à l'entourage d'un suspect qu'au suspect lui-même"
"A choisir, pourtant, j'aimerais mieux aller reprendre demain ma faction à l'entrée des quais que, dans une gare plus somptueuse, m'embarquer pour quelque petit coin ensoleillé de la Côte d'Azur." "C'est pourquoi je tiens tant à ce mot de "fonctionnaire" que d'autres jugent amoindrissant. […] Avec le même souci de tout connaître de mon métier et d'accomplir une tâche en conscience." "J'appartiens [au milieu] de ce qu'on appelle les honnêtes gens. Mais je connais les autres aussi, je les connais assez pour qu'un certain contact se soit établi entre eux et moi. […] Et tous les autres que j'ai rencontrés, que je rencontre chaque jour dans leur intimité la plus secrète. […] Il s'agit de les regarder […] avec le regard de la connaissance." Les Mémoires de Maigret n'ont pas seulement ceci d'original que c'est un personnage qui donne son point de vue sur son auteur, mais encore que ce roman évoque un lien particulier entre l'auteur et le personnage, qui n'est pas qu'une relation de créateur à sa créature, mais celui d'une amitié entre les deux. C'est comme si Simenon avait fait de Maigret son double, qui à la fois lui ressemble et à la fois est assez différent de lui pour devenir presque le confident de l'auteur, ou à tout le moins quelqu'un à qui on peut parler en dehors des romans où il apparaît. Rappelons ici la fameuse lettre adressée par Simenon à Maigret. Bref, Simenon est devenu "l'ami de la famille", en particulier de Louise, "enchantée de l'image que Simenon a tracée d'elle". Et cette amitié est devenue si profonde que c'est Simenon lui-même qui en est venu à "quêter l'approbation" de son personnage, puisqu'aussi bien, "Petit à petit, nous avons fini en effet par nous ressembler un peu. Je serais incapable de dire si c'est lui qui s'est rapproché de moi ou moi de lui. Il est certain que j'ai pris quelques-unes de ses manies et qu'il en a pris des miennes. […] C'est un des rares, sinon le seul personnage que j'ai créé qui ait des points communs avec moi." (extrait de l'interview avec Francis Lacassin en 1975). Gross, Hans: né en 1847 à Graz, mort en 1915 au même endroit. Juge en droit pénal, puis professeur à l'université de Prague et de Graz. Fondateur de l'institut de criminalistique de l'université de Graz et du musée criminel (site) de Graz. Auteur d'œuvres initiatrices pour le combat contre le crime, fondateur des "archives de criminologie". Chaussettes à clous: signalons que Boris Vian est l'auteur d'une chanson portant ce titre; vous en trouverez les paroles ici. 6 Février 1934: Emeutes sanglantes à Paris à cause de manifestations des ligues de l'extrême droite contre le gouvernement, suite à l'affaire Stavisky. Au cours du scandale financier des faux bons de caisse du Crédit Municipal de Bayonne, l'escroc arrêté en 1926 et mis en liberté provisoire en 1928, fut retrouvé gisant près d'un revolver le 8 janvier 1934. L'opinion publique ne crut pas à la thèse du suicide mais accusa la police de l'avoir assassiné sur ordre pour protéger de hautes personnalités. L'extrême droite exploita l'affaire en utilisant ses thèmes traditionnels : antisémitisme, xénophobie (Alexandre Stavisky était un Juif ukrainien naturalisé). Le 6 février 1934, des milliers de manifestants se rassemblèrent à Paris, convergeant vers la place de la Concorde, séparée de la Chambre des Députés par la Seine. Les policiers et gardes parvinrent à défendre le pont de la Concorde, malgré les jets de projectiles de toutes sortes. Quelques émeutiers étaient armés, et les forces de l’ordre tirèrent sur la foule. Le bilan des victimes fut de 16 morts et d'environ 2 000 blessés. A la Chambre des députés, la droite tenta de profiter de l’émeute pour contraindre le gouvernement à la démission. Mais la gauche fit bloc derrière Daladier. La séance fut finalement levée après que des échanges de coups eurent lieu dans l’hémicycle, entre députés de droite et de gauche. Dans la nuit, Daladier prit les premières mesures pour obtenir le rétablissement de l’ordre public. Mais le lendemain, ses consignes furent peu suivies et ce fut la première fois qu’un gouvernement dut démissionner sous la pression de la rue. Le 7 février au matin, la lutte reprit. Le choc avec les forces de l'ordre fut court mais violent (on déplora trois tués et soixante quinze blessés). La crise se résolut finalement avec la formation d’un nouveau gouvernement sous la présidence de l'ancien président de la République Gaston Doumergue. Qualifié de gouvernement d’«union nationale», il regroupa surtout les principales figures de la droite parlementaire. La gauche interpréta les événements du 6 février comme la preuve d’un complot fasciste. Les socialistes et les communistes contre-manifestèrent le 9 février. Les incidents qui les opposèrent aux forces de l'ordre firent neuf victimes. Le 12 février, la CGT (socialiste) et la CGTU (communiste) décidèrent d’une journée de grève générale. Cette journée marqua un premier rapprochement entre socialistes et communistes et porta en germe l’union antifasciste entre les deux partis, qui aboutit en 1936 au gouvernement de Front populaire, composé de radicaux et de socialistes avec le soutien communiste. Prix du Quai des Orfèvres: il s'agit d'un prix littéraire; voir ce site. Maigret au cinéma: voir en particulier ce site.